When it comes to your pool water and its chemistry, it’s likely due to a high pH or too much stabilized chlorine in the water. Either lower the pH by using dry acid until optimal chemistry is obtained, or replace some stabilizer with water to increase it. In regards to the filter, start off by backwashing it (if any parts require repair or replacement, do so). Increase your free chlorine levels to 10 PPM and then polish your water off with a clarifier. 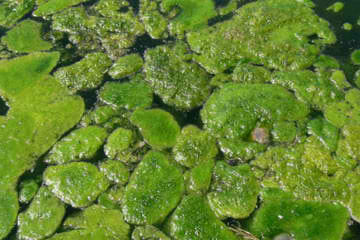 Green water is a clear indication of algae. This suggests that your chlorine levels are too low or that the chlorine has become ineffective. To solve this problem, shock your waters with unstabilized chlorine to kill off any algae, and then brush off any algae from the sides and bottom of the pool. After a day has passed, backwash your filters to clear out any dead algae and use clarifier to clean up the water. If you or your guests are suffering from stinging eyes, itchy and irritated skin, and/or a sore throat while in your pool, this is a clear indication that your pH levels are off or that your chloramine levels are too high. Dry acid can be used to lower the pH and soda ash to raise it, while super-chlorinating your pool can break down any chloramines and restore your pool water chemistry. What Affects My Swimming Pool Water Chemistry?